All 787 Dreamliners Grounded Around The World : The Two-Way The 50 planes owned by airlines around the world have been pulled out of service. The Federal Aviation Administration and other authorities cite an incident in Japan in which one jet's batteries emitted smoke. The Japanese report came a week after a similar incident occurred in Boston. In Tokyo today, a United Airlines 787 Dreamliner sat at a gate. Update at 10:10 a.m. ET, Jan. 17: All 50 of the new Boeing 787 Dreamliners owned by airlines around the world have now been pulled out of service so that engineers can figure out why some of the jets' batteries have emitted smoke — and in at least once instance caused a fire. 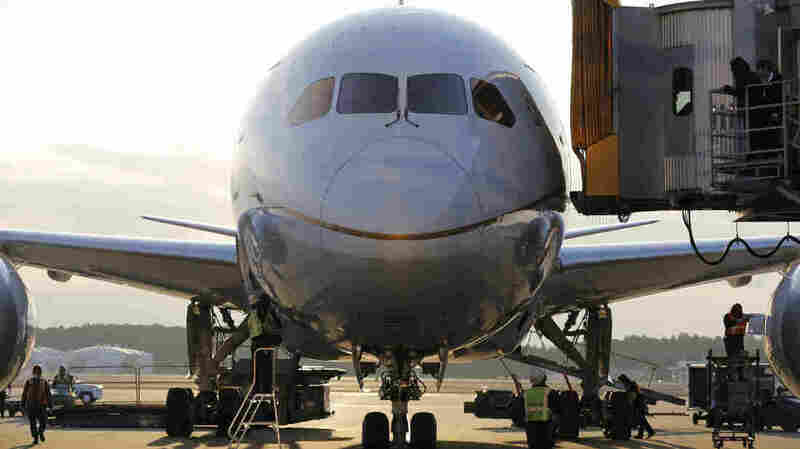 The Federal Aviation Administration has ordered the U.S. fleet of Boeing 787 planes to be grounded, citing an incident in Japan earlier today in which one of the jet's batteries emitted smoke. The Japanese report came a week after a similar incident occurred in Boston. The FAA says that its safety directive will also likely be followed in other countries, as well. The only U.S. carrier that currently uses the 787 is United Airlines, which the FAA says has six planes in service. The planes were grounded in Japan after an All Nippon Airways flight made an emergency landing Tuesday. The agency said Wednesday afternoon that it has issued "an emergency airworthiness directive", to look into "a potential battery fire risk in the 787 and require operators to temporarily cease operations." The FAA says it will work with Boeing and airlines to get the planes back in the air, as NPR's Wendy Kaufman reports on today's All Things Considered. The second incident in Japan involved a lithium ion battery. The FAA said, "The battery failures resulted in release of flammable electrolytes, heat damage, and smoke on two Model 787 airplanes." The BBC says Ethiopian Airlines has also grounded its four Dreamliners, which means all 50 of the planes owned by airlines around the world are now out of service. There are only two 787s being used by a European carrier, Poland's LOT, but they too have been ordered to stay on the ground, as the Los Angeles Times reports.